Mum drives into the car park and we go into School together. I hang my coat on my peg and put my boots on the floor below. Some of my friends arrive and the Mums chat about this and that. 9.15 am: The door opens and there is Maggie waiting to welcome us in. We sit down in a circle and Kate starts a song. Today, it’s the bird song and we all make sucking sounds as each bird eats up a worm! We say “Bonjour” to Kate when she calls our names and then Max counts all the children so that we know how many cups and saucers to put out later. Then I tell everyone about the fox I saw in my garden and Tom says that a fox caught his chickens. We’re learning about dinosaurs at the moment and I know all their names and which ones eat meat. The tyrannosaurus is my favourite. Kate says if he stood in our School his head would stick out of the roof! 10.00 am We put our chairs away, I had to show a new girl how to carry her chair properly today. Christina asks me whether I’d like to help plant some bean seeds. We’re going to plant 10 seeds and then dig them up one by one so that we can see what happens to them in the soil. After I’ve washed my hands I go and play with the dinosaurs in the sand with Felix. The stegosaurus has a nest of eggs and has to protect them from a hungry velociraptor! We’re making a dinosaur display and I help finger paint a huge picture of a diplodocus. My Mum put her handprints on a picture of a tyrannosaurus the other night when she went to an adult evening session in my School. Maggie shows me how to draw some letters. I have to trace a sandpaper “S” with my fingers. I think it looks like a snake and I liked making the “ssss” sound. On the computer, I play a game where I direct a caterpillar forwards, backwards and left or right to its food. 11.00 am I’m hungry. Tom and I finish our game, take our name cards off the board and wash our hands. 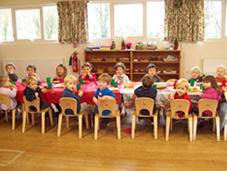 We get our cups and saucers and sit down with some children who are already having their snack. Good, I’m sitting next to Tom. He’s my best friend – oops I’ve spilt some of my milk I was pouring into my cup. Never mind – I know where to get a cloth. 11.30 am Time to go outside – just got to put my boots and coat on. Great, all the bikes are out. There was a pheasant in the garden but he went as soon as we all got out! 12.00 pm Time to go in. Mum will be here soon but there’s just time to listen to a story. 12.15 pm Susie asks the Mummies to come in. My Mum is so busy chatting to Laura’s Mum that she doesn’t hear Susie and Maggie has to ask all the Mummies to be quiet! How embarrassing! I go and say goodbye to Kate and she shakes my hand. Makes me feel ever so grown up.